see it for yourself. australia's most confronting illegal phoenix activity. One of the most sacred rules within our precious legal system has recently been broken by a Sydney law firm and this firm has connections to the highest office in Australia. It involves the practice of defrauding people by creating what is known as a phoenix company (sending a company deliberately 'broke' and transferring its assets into a new 'phoenix' company). Phoenix companies are a $3 Billion problem in Australia. To date, neither our current government or ASIC have taken any action in this particular case, but Australians can now view the evidence for themselves, right here below in just a few minutes, to see why an urgent independent investigation is needed. On Friday 31 March 2017, there was a judgment in the NSW Supreme Court which, among other things, ordered Sydney-based company Live Board Holdings Limited to pay $250,000 as 'Security for Costs' in order to proceed to a trial against its former director, Mr Pierce Cody and his new phoenix company Cody Live Pty Ltd. In over 3 years, Live Board Holdings has yet to be able to get to a trial against Mr Cody for its main case. Unlike any typical case, Live Board Holdings has been impacted by serious malpractice from a Sydney law firm named Whittens & McKeough Lawyers, who as you will see, have actively contributed to Australia's $3 billion problem of phoenix companies. So let's see what this firm - with links to the NSW Wentworth Liberals, has done. So illegally, so confidently. Whitten's & McKeough Lawyers are the former lawyers of Live Board Holdings Limited. They have been systematically assisting this director named Mr Pierce Cody, to defraud their very own client (subsequently its former client) Live Board Holdings. To see their initial client representation for yourself, click here for an extract of a letter from Whittens Lawyers 'acting for' Live Board Holdings. It wasn't too long before their conflict of interest as legal practitioners became reckless. So reckless in fact, Whittens even commenced proceedings representing other parties against their own client Live Board Holdings. To view that click here. Here they are, acting for Live Board Holdings as their client again, appointing administrators to it. In one of the biggest abuses of solicitor/client trust, here they are assisting Mr Cody (and his self-named phoenix company Cody Live ) purchase all of their client's assets, whilst its client was in administration. To top off the phoenix scam and ensure their 'now-former' client, was also left without evidence that can be used in court against its new client (and themselves), here are Whittens Lawyers confirming in a letter that all of Live Board Holdings documents (in addition to its assets) had now been sold to its new client, Cody Live. If that wasn't enough, here are Whittens & McKeough Lawyers, filing a Security for Costs motion against their now-former client, Live Board Holdings, for the benefit of themselves and their new client. This firm acts as if they are above the law. So, in order to learn why Whittens acted so illegally, so confidently, I had to dig a bit deeper. ​I don't know why Whittens & McKeough Lawyers have acted with such shameless disregard for the law. However in my view, it appears that creating a phoenix company is quite normal for this legal firm. In 2016, a letter was provided to the Prime Minister by the Deputy Opposition Leader Tanya Plibersek, on behalf of the parties affected by the conduct of Mr Pierce Cody and Whittens Lawyers (if you haven't already seen that letter, you can view it here). Nothing was done to assist Live Board Holdings. Nothing was done to end Australia's $3 billion problem of phoenix companies. We can now reveal that Mr Cody has previously assisted the funding of the NSW Liberals, including hosting Mr Turnbull and others, as confirmed in a promotional flyer below. It appears that Mr Cody may have met with the PM soon after Mr Turnbull had received that 2016 letter, an extract of an email I received about this, is also below. We don't know if Mr Turnbull or the other politicians in this flyer are fully aware of the extent of Mr Cody's tendencies, or the intricate details of Whittens Lawyer's operations. ​What is now very clear, is that when Mr Cody needed a law practice to break the law for him, he turned to the law firm of the former vice president of the NSW Wentworth Liberals. Live Board Holdings has now been left in court proceedings, without key evidence (it has been 'sold' to Mr Cody's new phoenix company) and is the subject of serious malpractice by its now-former legal representatives Whittens & McKeough Lawyers. As for the 'Security for Costs' judgment of March 2017 - the judge that delivered the decision against Live Board Holdings on 31st March 2017, Justice Stephen Robb, is the Liberal Party's former barrister. ​He had also been previously revealed by the Daily Telegraph to be part of that same NSW 'jobs for boys' saga as Mr Ray Whitten. You can view the 31 March 2017 judgment, by Justice Stephen Robb against Live Board Holdings here. In my view, it appears as though there is an ideology among certain sections of the NSW Liberals, which needs to change, in order to work towards ending the problem of phoenix companies, which affects thousands of people each year. In any case, there needs to be an urgent independent investigation into Whittens & McKeough Lawyers and the events in this matter. In my view, the public is at risk. Let's end Australia's $3 billion problem of phoenix companies. It starts here. Typically when a Company goes into Voluntary Administration it is considered a catastrophic event for it's Company Directors. However, that didn't seem to be the case for the Director I appointed to Live Board Holdings Limited - a former APN News & Media Director, Mr Pierce Cody. After Mr Cody and his Co-Directors placed the Company into Voluntary Administration, Mr Cody sent me a private smiley text message to my phone. How could he be happy after being a Director of a Company that has just gone broke. Did he know what was to follow? I appointed Mr Pierce Cody as a director of Live Board Holdings Ltd in May 2012, after I had invented the ‘world’s first digital real estate ‘for sale’ sign', called ‘Live Board’. On September 3rd 2013, Mr Cody, along with his Co-Directors Mr Richard Ochojski and Ms Finola Burke, issued shares without proper authority. Following the Supreme Court's refusal, Mr Cody and his co-directors were set to face further matters in Court including alleged personal liability for the unauthorised share issue and oppression. On February 18th 2014 however, Live Board Holdings Ltd was placed into Voluntary Administration. In a further Court decision on March 3rd 2014, I was unable to block the external Administrators (Holzman Associates) from being appointed as Administrators of Live Board Holdings Limited. The majority of the Company funds derived from the unauthorised share issue ($1 million), had been spent by Mr Cody and his Co-Directors including a significant amount spent between the date of the hearing in December 2013 and the date that the Court handed down its decision regarding the unauthorised share issue on 17 February 2014. It was immediately after the Court’s decision to allow the appointment of the Administrators on March 3rd 2014 that Mr Cody sent me that smiley face text. But I still could not confirm what Mr Cody was smiling about. It was also argued by the Administrator to the Court, in their pursuit of being validly appointed “that to return the Company to these Directors (Cody, Ochojski & Burke) would be a disaster”. The reason why the Company collapsed was due to the unauthorised share issue on September 3rd 2013, that was subsequently refused to be declared valid by the NSW Supreme Court on Feb 17th 2014. (click here to view full Feb 17th decision) I did not see this as a happy position for any Director involved in such an event. The smiley face text I received from Mr Cody on March 3rd 2014 had me thinking. However it wasn't long before I started seeing the possible reason for him sending me that smiley face text. On March 17th 2014 & subsequent to that day, I received a creditors report from the Administrator (Holzman Associates) recommending that Live Board Holdings Limited accept a ‘Deed of Company Arrangement’, which includes the sale of all the Company assets for only $305,000, to a new entity, of which the shareholders (directly or indirectly) were Mr Pierce Cody, Mr Richard Ochojski & Ms Finola Burke. The Live Board Holdings Limited assets had an estimated value over $4.1 million, just prior to the unauthorised share issue by these Directors. As a result, on my calculations, these Directors benefited by approximately $3.8 million from their unauthorised share issue of September 3rd 2013, which led to the company collapse. We are still in the process of assessing any benefit to other parties from this transaction. 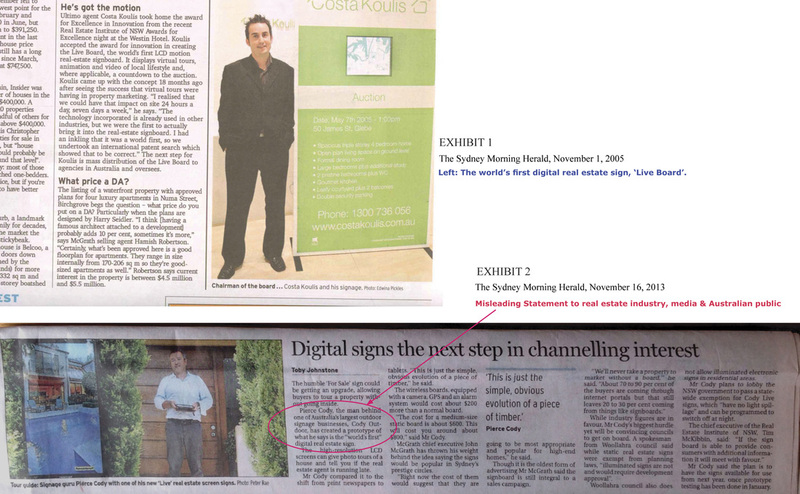 These Directors are now promoting ‘Cody Live Pty Ltd’, to the real estate industry, to the media & to the public, using the assets of Live Board Holdings Limited, benefiting by an estimated $3.8 million, obtained as a result of their unauthorised share issue of September 3rd 2013 as Directors of Live Board Holdings Limited. Ok, so what have I discovered since I received that smiley face text after the Company collapsed? That even though ‘Voluntary Administration’ is typically a catastrophic event for most Directors, that is not always the case. In this instance, these Directors benefited by a share of approximately $3.8 million. I have even more reason now, to continue to fight this vigorously for all those affected. I think it is important that we protect Australian innovation & Corporations from these type of events ever happening again in the future. For the record, below is that smiley face text I received after the Company collapsed. The case continues.